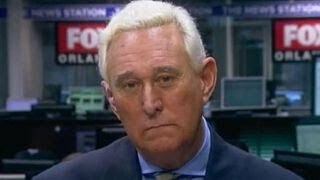 Speaking this Thursday on Sirius XM's Jim and SamShow, Stone described his life situation since being targeted by Special Counsel Robert Mueller. He says he's lost almost everything, and doesn't talk to his old friend Donald Trump anymore. "I've lost my home, my insurance, what little savings I had, my ability to make a living because people pay me to write and talk, and of course the things they want me to write and talk about are the very things I'm not allowed to talk and write about," he continued. "In the blink of an eye you can lose everything." "I moved from a nine-bedroom house to a one-bedroom apartment," he said. "I had to do the move myself with my wife renting a truck." Aw, gee. Maybe he can get a hand from his old pal Julian Assange. Well, I guess that's what happens when you're a criminal ratfucker who gets indicted on multiple felonies. Things tend to curdle pretty quickly. As for Donald Trump, well, they don't talk anymore, and that gives Roger the sads. "I've known him for 40 years. We're very good friends. I don't agree with everything he does, I agree with a lot of what he does." I may tear up a little myself.